On May 19th, 2017, I will cross a stage and have conferred upon me, a Master’s Degree in Business Administration. It will have taken me 1,215 days to complete from the time I first stepped foot in a graduate classroom, though in reality it has been a much longer journey than that. I always knew I would pursue higher education; it was something that was ingrained in me starting at a very young age. Neither of my parents had attended college, yet they knew the value of an education and knew that they wanted their son to have one. They taught me that if I worked hard enough and persevered, that I could accomplish anything that I wanted to, and I so I did. I worked hard and graduated high school with honors. I made it to college. I was the first in my family to do so. My parents were proud and so was I. Having done well in high school, I thought college would be easy enough. It was as if I had somehow forgotten all the effort I had to put in to get to where I was, all the countless late nights of doing homework and all the studying I had done. You see, I had fallen victim to the natural talent bias. I had thought that I was smart, and that being smart would be all I needed to succeed in college. My first year of college, I made few A’s and almost all B’s and C’s. I was shocked. How could this happen to someone who supposed to be smart? After a year, I decided to transfer Universities, thinking that the one I was in was just too hard. Not that it could be me. My first semester at the University of Nevada, Reno was a good one, and with renewed enthusiasm I made more A’s and B’s, and only a few C’s. I thought the C’s must have just been hard classes, right? The second semester though brought skipped classes, fewer A’s, and more C’s. By 1st semester my junior year, those C’s began to turn into D’s, and suddenly as I was happy if I had any B’s. Reality hit me pretty hard the end of my junior year. I had taken a test in my biochemistry class that I knew I did poorly on. When the grades were posted online, I saw that I had received 39%, the lowest grade in the entire class of 80 students. With tears in my eyes, I sat staring at my computer and all I could think was, “How could this happen to me? I’m supposed to be smart.” I ultimately went on to fail that class, and finished the semester with a 1.67 GPA. I lost all my scholarships, I lost my self-respect, and I very nearly lost the motivation to continue on. I felt defeated. My one glimmer of hope came from the single A I received that semester in my introductory psychology class, as well as the words spoken to me by a friend. He said, “Why don’t you just change your major to something else like psychology? You seem to really enjoy that a lot more.” Those words flipped a switch, and I decided to take a different path. For the last three years I had been pursuing something I wasn’t interested in, and it took its toll. This led to focusing on other things like partying, drinking, and skipping classes. But now would be different and I would pursue something I was truly interested in. The first semester of my senior year I enrolled in 18 credits of psychology. Through enormous effort, I made all A’s for the first time since high school, and even got some of my scholarships back. My second semester was 21 credits, 3 of which included the biochemistry class I failed. This time I scraped by to pass the class, and finished all my other classes with A’s. I graduated in the Spring of 2011, with a bachelor’s degree in psychology and a minor in biochemistry – the first in my family to do so. I didn’t want to stop there though. I had applied for the PhD program in psychology, to which I was denied given the many poor grades I had on my transcript. My plan was to take grad special classes and try again, but then something happened, something that would change my life forever. In October of 2011, my dad was diagnosed with a stage 4 glioblastoma, a form of brain cancer. Rather than studying for tests in grad special courses, I spent every weekend driving down to see him. Grad school was the last thing on my mind. On May 30th, 2012, just 7 months after being diagnosed, my dad lost his life to cancer. It felt like my world had been turned upside down. As it always does, life moved on and eventually after some time had passed, happiness found its way back. I got married and started a new career back at the University. However, just when I had thought I was content with where I was at, another obstacle came. My wife had been accepted into law school, and much to our surprise, we found out that my job would even pay for her school. It was a double-edged sword though, because that meant that I would have to stay in Reno while she completed law in school in Las Vegas for the next three years. We ultimately decided to go through with it. The first few months were hard, and I felt depressed and hopeless. I felt like all I was doing was working to pass the time while she was gone. I realized I had to make a change, and grad school began to creep into my mind once again, but like before I fell into the talent bias trap. I told myself that because I hadn’t been accepted before, that I wasn’t talented enough to make it in. Had it not been for the encouragement of my wife and many other gritty people around me, I would never have tried for grad school. 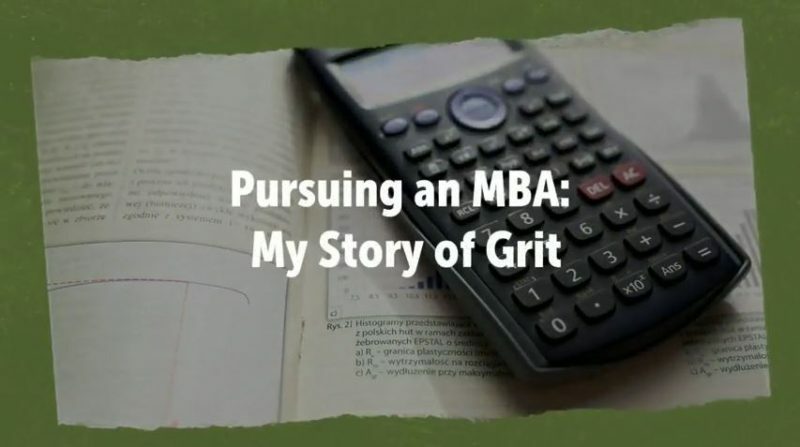 I decided to pursue an MBA because I had been fascinated by organizational behavior, and thought this would be a more practical way to apply it than through psychology. However, when I talked to the advisor, he confirmed what I had feared. My GPA was too low to be admitted. He told me that if I was serious about it, I had to take graduate special courses, I had to get A’s in both of them, and I had to take the GMAT test and pass with at least the minimum required score. This seemed like a daunting task and I already wanted to quit, especially considering I had never taken a single business class before, but I decided to go through with it. I enrolled in the grad special classes in the Spring of 2014 and got the A’s I needed. I took the GMAT and got the score I needed. In the fall of 2014, I was admitted as an MBA candidate, and to me, it felt like one of the biggest accomplishments of my life. It didn’t stop there though. I became engulfed in what I was learning. I studied HARD, and made A’s again and again. I ran and was elected to represent my college on the graduate student council. I created a business plan and made it to through to the finals of multiple competitions. I made friends from around the world. I surround myself in a culture of grit. I began pursuing other interests as well. I began cooking myself gourmet meals. I began building things and tackling home projects on my own. I started photographing everything and found myself soaring in a balloon over Reno because of it. I realized I was interested in so many things, and that all I had to do was put the effort necessary and practice. As my parents had once taught me, I could do anything I wanted so long as I was willing to put forth the effort. Before I knew it, three years had flown by and my wife had finally finished law school. We were together again at last. No more crossing days off the calendar. No more evenings doing homework in the airport. We had followed through on our goal and had finally made it. Now here I am, just one more semester away from graduating. I know I will do whatever it takes to follow through and finish my goal – a goal instilled in me since I was just a kid. With strong interest, much practice, and a renewed sense of purpose, I will walk across that stage and I will fulfill the effort put forth over the last 1,215 days. I will show my grit.